The sides above them were the two Manchester sides, Spurs, Arsenal, Bolton, Stoke, Blackpool, Sunderland, Blackburn and West Brom. Eleventh was not “right up there”, and it was that kind of comment, tied into the poor quality of football being seen on the pitch, that was adding more and more pressure on the owners to get rid of the boss very few Liverpool supporters had wanted in the first place. But he seemed unable to admit that any of this could be down to him: “But of course there’s lot of reasons for it, you know, there are to some extent injury situations and also, more to the point you know, one or two of our so called star players, who are going to be the ones who bring us up to the levels, are still trying to find the form that they had in the past that will bring us there. “I’m expecting the next games to go better, I’m expecting to see the team – if anything – climb the table, not to go back down the table.” Liverpool were ninth in the full table at the time. It was the day after Sam Allardyce was sacked but when Roy was asked if he’d be next he claimed not to have any fears about that: “No, I don’t have any fears, I don’t have any worries, I don’t have any concerns. “The owners have made it perfectly clear and certainly they said yesterday they are in it for the long term and they are going to be patient, they realise it is going to take time. It seemed never to occur to him that one of his jobs as manager was to get the best out of the players he had, regardless of who’d actually signed them. And maybe that was what finally brought the curtain down on his time as manager. He was telling supporters it was hopeless. He was suggesting there wouldn’t be enough money coming into the club to buy players that might help turn things around. He was saying that he was as good as any manager out there and that if he couldn’t get things right then nobody else could either. A few weeks later the ‘magic wand’ Roy said didn’t exist was finally brought into action. Kenny Dalglish was his name, of course, and supporters had been calling for him for some time. 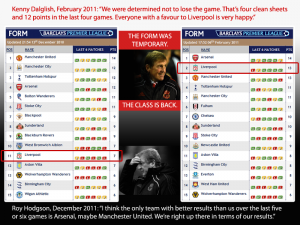 A month after Kenny got the job back Liverpool are – on form at least – “right up there” with Arsenal. As for “maybe Manchester United” – well they’re just below Liverpool in that form table. Liverpool are now sixth in the league and six points below the Champions League places, after a run of four straight wins. That includes two away wins – yesterday’s at Chelsea was the second – and that’s double what Roy managed in his whole time as manager. It’s still early days, but a growing number of observers have started to notice what Liverpool supporters said all along. That Kenny Dalglish coming back to manage The Reds was nothing at all like Kevin Keegan going back to manage Newcastle. That his time out of the game wasn’t going to be such a problem. That his reputation was his risk, nobody else’s. If only the previous board had seen this, had realised how much of a difference it could make, had listened to the fans instead of the sections of the media that really know nothing about Liverpool FC. And those fans know more about their club than anyone else does. A great article. I could not have expressed the situation any better. 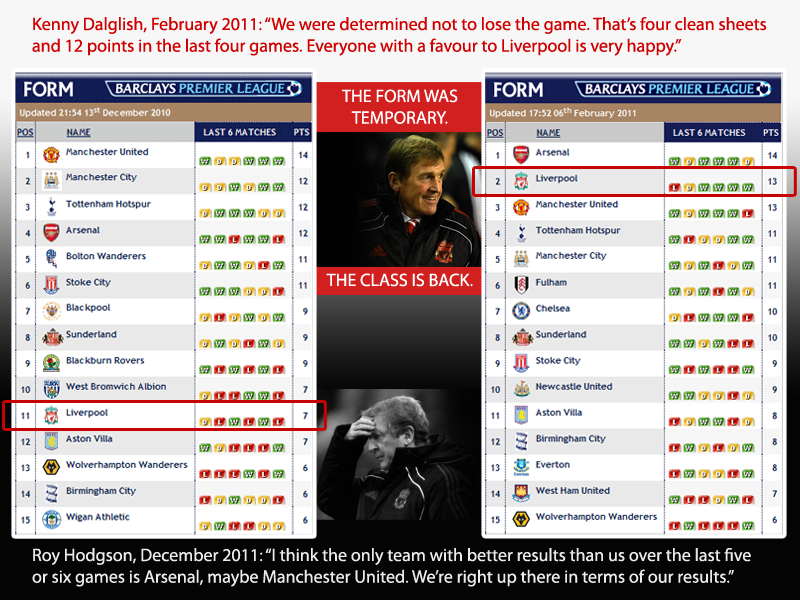 The ‘there is no magic wand’ quote is my favourite part as it just showed how negative Roy was as Liverpool manager. How members of the media can defend him and sometimes praise him for what is happening at Liverpool now is crazy. The only good thing that he did (apart from leave) was bring in Meireles. Top article Jim. It just shows what is possible with a bit of self belief that Kenny has brought to the collection of players that Roy had more or less written off. With home games against Man Utd, Man City and Spurs we have our destiny in our own hands to get to 4th or better. Chelsea have three good strikers but no system, Arsenal can collapse like a pack of cards, Spurs are having striker problems and are missing Bale. And City? Well City will do what City always do and mess it up yet again!! And I still don’t know how Utd are top with so many games where they’ve looked so poor. This season, 4th is possible. But next season with Carroll, Suarez and more quality summer signings who knows where Kenny can take us? Time to get that contract out Mr Henry! As far as I can see Kenny is doing exactley what he learned under Bob Paisley and what he himself carried out as Manager, a little while ago. To say that everyone is pleased with the miracle he has worked is an understatement, the fans were always behind him and most of the players greatly admired him, the Board were unsure and but for Roy’s terrible time aa Manager the change may never have been made. But thank you Roy for all your efforts, in the end you made the Boards decision easy. Now we look forward with anticipation of what the last part of this season holds for us, if perchance LFC do qualify for the European Champions Cup that whoud be the iceing on the Kenny’s Cake. Then we look forward to whoever he brings in. One last comment – Dissapointed to read of Peppe’s comment that he could move, especially as the owners promises now look to be taking shape. Amazing, our club has scoured the world and spent millions of pounds looking for the right manager and there he was living just up the road. No outsiders to be considered in future please ! Just great to see us getting back to what we do do best – pulling together with all business conducted with discretion. The last few years have been a nightmare, Hicks & Gillette just about ruined the club but that’s all behind us now. The future is looking just great and if any player wants leave – let them go, whoever they are they can be replaced with someone just as good who actually wants play for Liverpool. Please note Mr Torres, romance is not dead in football as far as the fans are concerned and it they who pay your wages. Also pleased that it looks like Liverpool (& Everton) look like remaining in situ, it makes sense to me but consideration MUST be given to the redevelopment of the entire area.